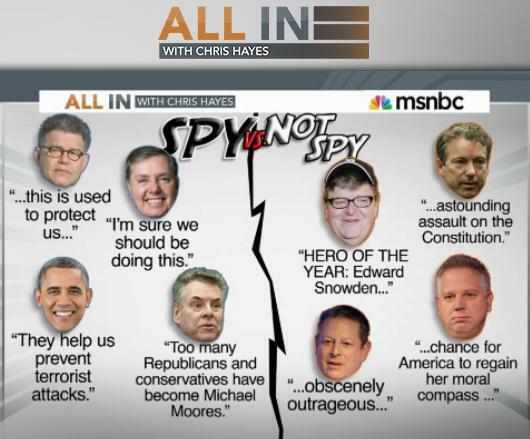 The odd politics of support for the NSA’s intelligence gathering/data mining program, from Chris Hayes’ “all In” program. The politics surrounding the Edward Snowden case continue to get, well, weird. Last night, Christopher Hayes admitted that he found himself on the same side of the Snowden issue as Texas Congressman (and one-man punchline) Louie Gohmert. Gohmert also found himself in a strange place–he was on the side of the ACLU at a news conference announcing that the ACLU was taking the NSA to court. Thus, you have ‘conventional’ liberals like Al Franken and Barack Obama on the side of ‘nothing to see here/ Snowden is a traitor/we’re protecting America from Terrorism”. On the ‘Snowden is a hero’ and ‘abrogation of the constitution’ side, there’s Michael Moore and Al Gore flanked by the likes of Glenn Beck and Louie Gohmert. Thus, Christopher Hayes finds himself sharing oxygen with Louie Gohmert. But this isn’t an MSNBC talking point–Lawrence O’Donnell has sided with the ‘nothing to see’ crowd and is not looking at the implications of having the government have the power to do this surveillance. This is not ‘something we’ve always known about’. Yes, it has been clear that this capability was part of the Patriot Act and subsequent encroachments onto the Fourth Amendment, but the full scope of what was being done was not shared with the American people. The legislators who sat on the Intelligence committee knew what was being done, but were not allowed to talk about it; the legislators who sat on Homeland Security didn’t know about the extent of the data collection, and were shocked by how much raw data was being sucked up. There has been a sea-change in the Democrats reacting to this invasive technology. Obama and Joe Biden and a host of ‘Liberal’ Democrats have been caught on archival video castigating the Bush privacy attacks back in 2006, while now defending even more invasive programs under the current administration. And although partisan Democrats are beating the drum for the ‘Snowden is a traitor’ meme, a recent poll cited by Greenwald shows that Snowden’s actions were approved by some 53% of Americans (many of whom nonetheless thought he should face jail time). Other polls show the public split. While that isn’t a ringing endorsement, it’s a better favorability rating than either the White House or Congress enjoy. As Glenn Greenwald just wrote, there has been a full-court press under the current administration to demonize whistle-blowers and label Snowden as a traitor. You should click on the link and read what Greenwald has to say, but I will also point you to the video confrontation between Mika Brzesinski and Greenwald a few days ago, when Greenwald called out Brzesinki for ‘repeating White House Talking Points’ about the Snowden case. All of the issues about the national security state are coming to a head right now. The Guardian articles come to a public that is just becoming aware of the cases of Bradley Manning and Jeremy Hammond. As I’ve written before, we’re in the early stages of asymmetrical warfare between the Anonymous collective and the US government. It’s too early to pick a favorite, but I tend to bet on the underdog. In the meantime, if you want some context for all of this, I’d suggest you look at the work of the Campaign for Accountability of American Bases (CAAB). Lindis Percy and friends have been reporting on the NSA’s spying in Europe for several decades. Back when the Bush Torture program was in full swim, many human rights activists pointed out that historically, every government that has engaged in torture against ‘enemies’ has eventually used it against its own citizens. That probably goes double for the national security state spying on the world. As Snowden told the Guardian last Sunday, “If they want to get you, in time they will“.